Crete, Greece's biggest island, has a lot more to offer besides sun and sand. If two lazy, barefoot weeks on a beach, punctuated by strolls to nearby tavernas for calamari and resin scented wine is your idea of vacation heaven, you won't be disappointed. But there is a lot more packed into an area not much bigger than the state of Delaware that has 8,000 years of history, dramatic ruins and mountain ranges, over 600 miles of coastline and gorges for every level of hiker. And of course, there's always a beach and a tavern at the end of every excursion. Here are the top things to do on Crete. Visit Crete and you must visit Knossos, a Bronze Age settlement that was the center of Minoan civilization, said to be the oldest in Europe. Knossos is considered the oldest surviving city in Europe and it, in turn, is built on even older, Stone Age settlements going back to 7,000 BC. Excavated between 1900 and 1931 by Sir Arthur Evans (and still being excavated today), Knossos is traditionally associated with the legendary King Minos, and the mythical maze prowled by the Minotaur. The stories arose because of frescos discovered in the Palace of Knossos that depict Minoan bull dancers, but it's more likely the maze was at Phaistos in south Crete (see below). The palace, a structure of about 1,000 linked rooms and chambers, is brightly painted in shades of ochre. Much of it, including parts rebuilt in concrete, is more of an imaginative recreation than an archaeological reconstruction. Evans, keen to promote his theories and preserve as much as possible during a time of political upheaval in Greece, used flakes of paint found during the excavations to determine the colors of the columns and frescos. The polychrome results are often criticized by modern archaeologists, but despite this, Knossos, the number one visitor attraction on Crete, is a huge and fascinating place to visit. Admission in 2017 ranged from €8 to €15 but there is an unusually long list of conditions through which you could be eligible for reduce - or even free-admission. It's worth checking the official website to see if you qualify. It's an enormous site with lots of steps, hills and levels so wear sensible shoes and carry some water. Knossos is only partially wheelchair accessible. The new Archaeological Museum of Heraklion is packed with objects artifacts discovered at Knossos and elsewhere on Crete. Opened in 2010 and nominated as European Museum of the Year for 2017, its collection includes original frescoes from Knossos, bare bosomed figurines of the snake goddess and several remarkable works of Minoan sculpture. And if you haven't had enough archaeological digs for one trip, plan to visit the Minoan excavations at Phaistos, believed to be the real location of King Minos's labyrinth. Chania - The Maritime Museum of Crete, opened in 1973, in the walls of the Venetian "Firka" Fortress. Walk the fortress walls for photogenic views of the Chania lighthouse, one of the oldest in the world. Heraklion - The Venetian fort that guards Heraklion's old harbor is known by its Turkish name, Koules, but it was originally the Venetians' Castello de la Mare. A multi-media museum on the ground floor traces Cretan history and the history of the sea fortress itself. There's also an exhibition of finds from famous shipwrecks or you can climb to the top for views from the battlements. Rethymnon - The hilltop, star-shaped Fortezza is one of the largest Venetian sea fortresses in the world. The Archaelogical Museum of Rethymno is just beside the entrance. Chania and Rethymnon are well worth visiting even if ancient forts and museums are not for you. 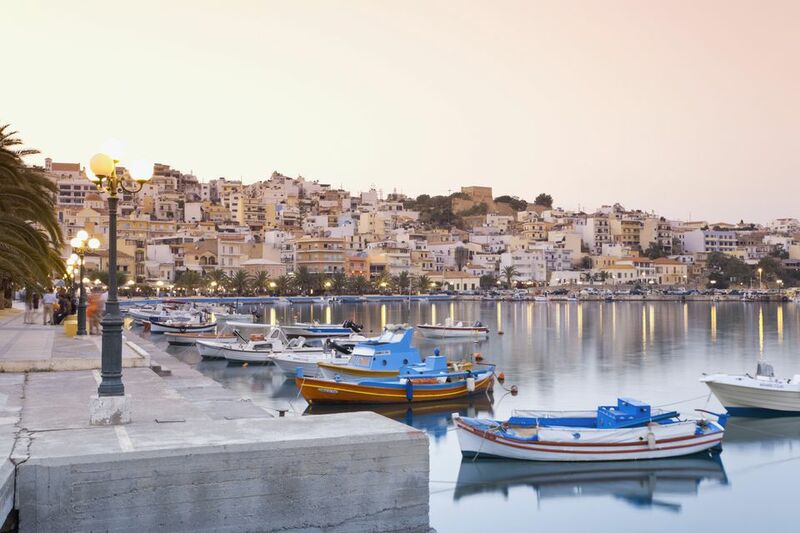 Both have extensive old towns, packed with colorful Venetian houses, tiny churches, local shops (look for pottery, jewelry and carved olive wood) and kafenion - Greek island cafes where you can eat sweet, honeyed pastries and drink strong Greek coffee. Crete's mountainous spine is crisscrossed with gorges. There are dozens of them — some challenging and all but inaccessible, some about as easy as a walk in the park. The most famous, the Samaria Gorge in the heart of the White Mountains National Park, south of Chania. It descends from about 1200 meters (3,900 feet) above sea level at Xyloskalo to the beach near the village of Agia Roumeli over a distance of 16k (just under 10 miles). The gorge itself is 13k (about 8 miles) and the walk to the village is another 3k (1.8 miles). After a steep descent at the start, Samaria levels out into fairly easy walking. It varies from 150 meters (492 feet) wide to only three meters (less than 10 feet) at the dramatic pass known as The Gates. Because it can take between four and eight hours to complete, the Samaria Gorge is more of an endurance test than an adventure challenge. Years ago, hikers had to carry their own water and supplies but now, as its part of the National Park, there are rest stops with water (most with toilets) about every mile and a half. There's a small entrance fee of about €5. Keep your ticket because it will be collected when you exit the gorge (to make sure no one is left behind). Samaria is open from early May until mid October but, if you can, avoid the hot summer months and walk it in May or after September. You can walk Samaria on your own but if you book a group walk you can be sure that a ferry will be waiting for you at the end of the walk to take you onward to villages and bus stops. Don't worry, if you sign up for a group walk, you won't be in the middle of a parade. It just means that you have an appointment to meet a ferry at the end. See the gorge the lazy way starting at the bottom and going to the Gates (about 2.8k from Agia Roumeli) or into some really spectacular scenery just beyond the gates. If you spend the night in Agia Roumeli you can enjoy the easy walk in the cool shade of the morning. Aside from Samaria, there are quite a few Cretan gorges that offer short, relatively easy walks through fennel-scented valleys or to waterfalls and cool, green pools you can swim in. One of the best of these is Richtis Gorge in Eastern Crete. The gorges are great havens for wildlife, flora and fauna of all kinds. If you are interested in exploring further, My Crete Guide has an excellent online and downloadable catalogue and app of all the walkable gorges and canyons. The high plateau of Lassithi, on the western end of Crete, was once covered with more than 10,000 gleaming white windmills, their distinctive sails slowly turning as they pumped irrigation to the plain. Today, more than half of them have been replaced by diesel powered pumps but there are still enough of these traditional windmills - unique to Crete - to make a photo safari worthwhile. If you're not comfortable driving in Crete (the mountain roads up to Lassithi can be daunting), hire a taxi driver for the day from Heraklion or Agios Nikolaos. Stop for a traditional Cretan lunch at Taverna Vilaeti in the village of Agios Konstantinos, on the plateau. After, aim for the village of Psychro and its cave, the Diktaion antron, traditionally the birthplace of Zeus. It was here, according to legend that the Titan Rhea hid the baby Zeus from his father Cronus (who, ahem, wanted to swallow him). The cave, on the slopes of Mt Dicte above the village, is reached by a short, steep but paved path. Tickets (in 2017) cost €6. Inside there are several chambers, giant stalactites and stalagmites, an ancient altar and a lake. Offerings found in the cave are kept in the archaeology museum in Heraklion. Lyrarakis Winery - The family vineyard produced its first vintage in 1992. This winery is credited with saving two rare native varieties - Dafni and the green apple scented Plyto from extinction. The tour packages are great value, starting (In 2017) at €5 for a guided tour of the vineyards and the cellar and a tasting of six different wines accompanied by rusk and olives. Douloufakisa - This is another vineyard that had been producing grapes for other people's wines since the 1930s. They're now focused on their own vintages of native grapes and natives blended with international varietals. The winery is open to visitors year round by advance telephone booking, with a €5 tasting fee.